To celebrate the last hurrahs of a group that represented a pillar of the UK’s music scene for virtually half a century, here’s a playlist of Quo’s finest yet possibly most under-appreciated dandruff-shakers, culled from the super-creative decade of 1971 to 1981. There are absolutely no apologies for the inclusion of three tracks from 1974’s Quo, the band’s heaviest album, nor a dearth of household name hits such as Caroline, Down Down or Whatever You Want. But first a disclaimer: headbang to all of these songs in succession and you could end up requiring some sort of neck brace. Proceed with caution. In 1971, Quo had abandoned their psychedelic roots, jettisoning the Carnaby Street threads for the dirtiest jeans they could find. Life was a struggle but the new, rockier show spoke for itself and they were enjoying a second wind. Penned by Rossi and road manager/unofficial fifth member Bob Young and including the lines ‘She was a big one, a met-at-a-gig once/A mean, mean girl’, Mean Girl is a heads-down-see-you-at-the-end classic that the band could and really should have performed live far more down the years. A single from the band’s breakthrough album, Piledriver, was developed from a poem written by Young, though co-author Rossi once admitted he “might have been trying to copy” Virginia Plain by Roxy Music. Its third verse about the ‘Three grand Deutsche car’ refers to newly acquired auto that had begun ferrying Quo between gigs. “We had suddenly realised that we were the band of the moment,” Parfitt told this writer in 2013 whilst looking back at Piledriver. “We really didn’t think that anyone could touch us.” He was right. You could almost feel the twin ripples of surprise and delight when Quo’s reunited Frantic Four line-up – Rossi, Parfitt, bassist/vocalist Alan Lancaster and drummer John Coghlan – tore into this cult favourite on their tours in 2013 and 2014. For many in the audiences, it was a moment for which they’d waited all their lives. Most tunes from the Parfitt-Lancaster stable kick like the proverbial mule, and despite its somewhat feminine-sounding title Blue Eyed Lady is actually a gritty, hard rocking pick-up song with a superb lead solo from Rossi and lyrics guaranteed to enrage the feminists (‘To who do you belong little blue-eyed lady?’). Penned by Rossi and Young, quite possibly during a tour of the States for Hello! (which might explain its lyric of: ‘I’ve gotta jump a ride on a cattle trucking slow train’ – you don’t get many of those on Network SouthEast), Slow Train is a multi-tempoed hard rockin’ boogie classic of the very highest order. It’s also the live favourite that got away. To this day, Parfitt and Lancaster don’t recall it being performed in concert, Coghlan has “vague memories of giving it a try”, and Rossi doesn’t have a clue. Tantalisingly, Lancaster had “wanted to do it on the second [Frantic Four] tour.” Well, that’s a ‘new underwear please’ thought if ever there was one. Here’s a change of tempo, and a welcome breather following the excesses of Slow Train. Powered by Coghlan’s metronome beat, Nightride is slow, chunky and unapologetically heavy. On The Level is crammed with fantastic, upbeat anthems such as I Saw The Light, Over And Done and What To Do that have somehow contrived to fly beneath the radar of the casual rock fan, but there are times when only a mid-paced, hair-flailing, dancefloor chug-a-thon will do, and Nightride fits the bill to perfection. Some may consider Again And Again a little too far on the dumb side (Francis Rossi figures among their number, for what it’s worth) and given that the word ‘again’ appears 64 times during its three and a half minutes, there’s a grain of truth to that theory. However, when the song concerned is an irrepressible headbanger-friendly anthem composed by Parfitt, keyboard player Andrew Bown and Jackie Lynton, the former Savoy Brown frontman whose dulcet tones introduced the Status Quo Live! album, perhaps the naysayers are becoming just a little bit too over-analytical, n’est-ce pas? A punishing tour schedule had caused Quo to tire at the end of the 1970s. Living in isolation around the word as tax exiles was affecting band morale and the jibes of the press took their toll, hence the line of ‘Old men in boys’ clothes has gone beyond a joke, so skin me another and pass along the whisky and Coke’ in Whatever You Want’s swansong of Breaking Away. But it was the one-two punch of the co-joined Come Rock With Me and Rockin’ On that echoed the classic 12-bar Quo of old, a potent reminder that they could still summon their vintage-era magic if they really set their minds to it. 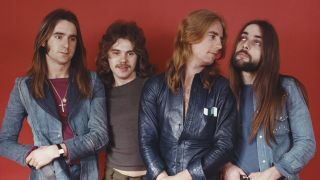 On the grounds that it was the final record to feature John Coghlan, Bob Young also having been moved into a more administrative role, some Quo purists cite Never Too Late as the band’s last great album. Though much what followed has undeniably been patchy and some of it pitiful, the description of Never Too Late flatters to deceive. Recorded at the same sitting as predecessor, Just Supposin’, it contains some credible material but a far superior album would have been made by pooling the tracks and exercising some quality control. But in some ways it’s fitting that Rossi, Parfitt, Lancaster and Coghlan (plus Andrew Bown, a full-time member for several years) would sign off with a real bona fide boogie-rock humdinger, but that’s exactly what they do with Rossi and Bernie Frost’s Riverside, a track that really puts the ‘frantic’ in Frantic Four.